Serbia-Montenegro has withdrawn from the Eurovision Song Contest following a row over the country's national entry. A Montenegrin panel of judges was accused of tactical voting earlier this month at a competition to decide the official song for the 2006 contest. The vote saw Montenegro's No Name chosen as the winner, but Serbia called for the vote to be restaged. When Montenegro refused to agree to a new contest, no solution could be found and the country withdrew. The European Broadcasting Union was officially informed of the decision at a meeting in Athens, where the 2006 Eurovision contest will be held. "It would be better for all of us not to have a representative at the contest in Athens," Aleksandar Tijanic, the head of Serbian broadcaster RTS, said in a statement. "Otherwise, we would have to accept manipulations, pressures and blackmails imposed by the music clans and political mentors who brought us to this embarrassing situation." Mr Tijanic is also the head of the UJRT, an umbrella organisation designed to mediate between broadcasters from Serbia and Montenegro. RTS had suggested that the five acts from both countries of the union should take part in restaged contest, with the winner determined by public voting. But the proposal was rejected by Montenegro broadcaster RTVCG, saying No Name were the country's legitimate representatives and voting had been fair. RTVCG representatives did not give any points to any Serbian acts at the national final in Belgrade on 11 March. 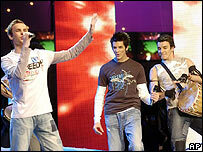 The audience booed and threw bottles at the stage when No Name were declared the winners, and the group were forced to leave the stage without performing a reprise of their song. All the members of the UJRT's board later agreed that the judges from Montenegro had violated the statute and the spirit of the Eurovision Song Contest. Croatia has been officially awarded a place in the final and no longer needs to take part in qualification heats. Serbia-Montenegro faces a fine of up to 35,000 Swiss Francs (£15,000) and a possible three-year ban from the contest. The nation first took part in the Eurovision Song Contest in 2004, when popular Serbian singer Zeljko Joksimovic finished second. At the 50th contest in Kiev last year, No Name represented the country amid similar claims of vote-rigging, finishing seventh. Montenegro is due to hold a referendum on declaring independence from Serbia on 21 May - the day after the Eurovision Song Contest final.